So you have taken the plunge and you have decided to head for Amsterdam for one of the biggest street parties in Europe. This is a commendable decision that you sure won’t regret. 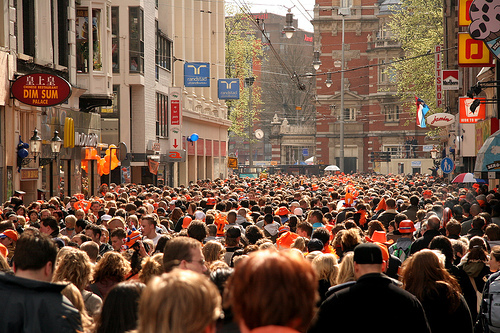 As you pack your orange into your suitcase here are a few suggestions for how to best enjoy Queen’s Day and not get overwhelmed by the scope of what you see happening around you. In Amsterdam going to the toilet pretty much anywhere is a bit of a tradition. Don’t be surprised to see guys relieving themselves against walls or into the canal. If that level of public urination isn’t your thing then plan your washroom breaks a little. Guys, as usual when it comes to peeing, are in luck there are numerous portapodies set up around the city. Girls, there are portable toilets set up in various locations, or you can try to queue up to use the toilets in a bar. Using a bar or restaurants facilities may be attached with a price however. Though technically it is possible to ride a bike, especially when you’re a little ways from the real Queen’s day hotspots, once you get close to any of the parties there will be so many people on the streets that it this will be impossible to ride. Your best bet is to just walk everywhere. This is fun anyway since there are parties everywhere and chances are you will find yourself in the middle of one unexpectedly. Especially if you are interested in taking in the free market sales (oddly, with the Queen’s Day parties a mass rummage sale is also going on) or being able to move around freely get out there early. By noon concerts and outdoor parties will be well underway. From that point forward, like it or not, you will be elbow to elbow with people struggling to move in some locations. 4) Do be sure to go near the Amstel River or one of the Major Canals. An interesting aspect of Queen’s day are the boats that navigate the major water ways. Party barges blasting house beats with people dancing on them are a spectacle that has to be seen. The boats try to jack up their sound systems, some of them which are already impressive to begin with, in order to get the most attention from spectators on the bridges and shores. This is a party like no other. Being there will show you just how free the Dutch really are. They make their biggest city into a party for a day. Don’t worry about too much everyone is friendly, as the Dutch always are, and everything is tolerated. So drink, smoke and be merry!